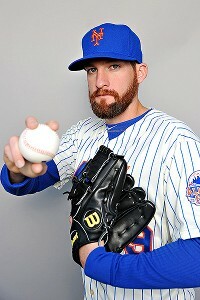 What will Bobby Parnell ultimately become? This past series against the Marlins was an interesting one for Bobby Parnell. He suffered a blown save, a benching of sorts and easily converted a save. In a nutshell those three games seemed to sum up Parnell’s young career as a closer. The blown save in game 1 of the series was a tough one to swallow. Parnell pitched well overall, but Colin Cowgill misplayed a fly ball that ultimately gave the Marlins the base runner they needed to tie it up in the 9th. Collin’s asked Parnell to pitch the 10th inning and he finished that off nicely but the Mets went on to lose the game in the 15th. Tuesday Collin’s allowed Jeremy Hefner to pitch the 9th inning in an attempt to throw a complete game, despite hovering around 100 pitches. He quickly got into trouble and Brandon Llyon was brought in the game rather than Parnell. He was not happy about this and expressed his displeasure following the game. Collins said he was simply protecting Parnell from being over worked early on after throwing two innings the night before. In the final game of the series Collins went back to Parnell for the save and he took only 7 pitches to finish off the Marlins and salvage a game in the series. Parnell is in his fifth full season with the Mets and the 24-year-olds role has been constantly changing. Initially he was looked at to become a starter, but that quickly changed as the Mets decided he was better suited for the bullpen. His roles slowly began to increase out of the pen. He started out as a middle reliever and then last year he became the teams set-up man. Now in the absence of Frank Francisco has become the teams closer. So far he has closed out three games this season with two blown saves while posting only a 1.46 era. Despite having two blown saves, he has easily been the best pitcher in the Mets bullpen (I realize that’s not saying much). Parnell has the stuff to be a closer. He throws in the mid-to-high 90’s, even touching 100 at times in his career, and his breaking ball he learned from Jason Isringhausen has become an effective second pitch for him. My question has always been does he have the make-up to be the closer? In watching interviews with him he has always come off as a shy, timid guy which made me question if he would be able to handle this role, especially in New York. I only question this because closer’s face much more media scrutiny than other relievers and it takes a certain mentality to be able to handle that day in and day out. I thought Tuesday was a big step forward as Parnell was genuinely angry he was not put in the game and wanted the ball day after a blown save. That’s what you need in a closer, a guy who is able to start each day with a fresh start not worried about the previous days results. With no real-time table set for Francisco’s return, the closer job will remain Parnell’s. With the way this team currently stands, I think this should be Parnell’s job for the duration of the season, unless of course he really blows up. Francisco is in the final year of his contract and we all know he will not be brought back. Parnell is young and certainly has proven he deserves a spot in this bullpen. It’s time to let him mature into the role and see if he can develop himself into the closer of the future. We spend a lot of time talking about how the Mets future lays in the hands of our young starters Matt Harvey, Jonathon Niese, Zack Wheeler and Rafael Montero. But the game is about pitching, not just starting pitching, we have to develop our bullpen as well. The successful teams around the league have pens full of young arms that they surround with a few veterans to fill in the holes. This is something the Mets need to improve on as Sandy Alderson has done a poor job, and that’s putting it kindly, of building this teams bullpen. Lets hope Parnell proves he can be more than just a middle reliever and that Sandy can surround him with other young arms to build around.